Does The Impressive Spec Of The CrystalTec CT101M Magnetic Resistance Exercise Bike Lead To A Good Workout? This product is no longer available. You can find other popular items here. The specification for the CrystalTec CT101M Magnetic Resistance Exercise Bike certainly makes it sound like an impressive machine. It contains a magnetic bidirectional flywheel for adjustable resistance settings, it is constructed from aviation aluminium and there is a digital display for data on speed, calories, heart rate and RPM. There is also the added selling point that this is an attractive, compact machine. 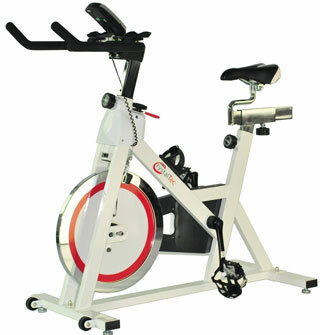 Does this indoor aerobic bike have everything that buyers need? Have The Designers Of The CrystalTec Aerobic Exercise Bike Really Thought Of Everything? This product is now discontinued. You can find other popular items here. The CrystalTec Aerobic Training Exercise Bike is an odd, compact looking bike with its white body and hot pink details but it has a specification that is enough to convince buyers that it will do much more than just look pretty in the corner of the lounge. 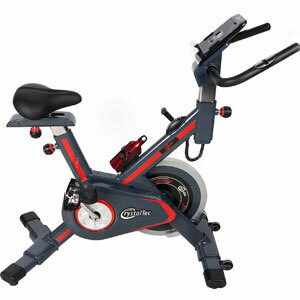 This adjustable, chain-drive, steel-framed bike has many resistance settings thanks to a heavy 18kg flywheel, a digital display for information on time, calories burned, speed and distance, levers for tension and resistance that are designed for easy access and even a bottle rack and transport wheels. Copyright © 2019 · Exercise Bike Reviews, All Rights Reserved.